I started a quick summary of the QF results in this post, but it quickly became too long, so it merits its own post, I think. So, what did we have today? Lots of rain, some surprises, and great successes for players in their home tournaments. Philipp Petzschner was the first one to go through to the semifinals in Munich, defeating Potito Starace 7-6(3) 7-6(6). Germany will definitely have its own player in the Munich finals, as Florian Mayer was the second player to win QF there - 7-6(4) 3-6 6-4 against Dimitrov, and he'll play against Petzschner in the semis. However, Philipp Kohlschreiber managed to lose 6-4 6-0 (!!!) to Radek Stepanek, so we won't see an all-German final match. In any case, the second semifinal looks promising, Stepanek will play against Davydenko (who beat Marin Cilic) tomorrow. In Estoril, Juan Martin Del Potro added another win over Robin Soderling to his resume. 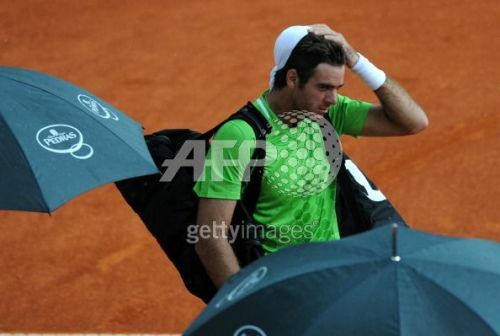 After winning the first set 6-4, he was down 1-4 in the second when a long rain delay interrupted the match. Returning to the court after a couple of hours, he embarked on a spectacular comeback, broke Soderling's serve two times in a row and won the match 6-4 7-5. In the semis he'll meet Pablo Cuevas who won against Thomaz Bellucci, 6-4 6-2. Feliciano Lopez was the first to become a semifinalist in Belgrade today. He had a great run thus far this week, defeating Juan Monaco 6-4 7-5, Fernando Gonzalez 6-4 7-6(5), and today - Albert Montanes, 6-4 6-4. Considering the fact that he's not exactly a clay court specialist (while all of them... are), it's even more impressive. Next he'll be playing against Filippo Volandri, who won his match with Marcel Granollers 6-2 6-4. Janko won his match against Somdev Devvarman 6-3 3-6 6-4 today. He was serving for the match at 5-3, saved 3 breakpoints being 0-40 down, but was broken anyway for 5-4. However, in the next game Devvarman completely choked, more or less, missing some easy shots, and Janko won the game to love, breaking back and winning the match. Thanks for the link. I get it now, nice!